The recycled LCD glass from Spring Pool glass which is containing silicon oxide and aluminum oxide. Alumina is a main component in rubies, sapphires and other rare gems. Its crystal has a hard structure. A component like silicon oxide has a low coefficient of expansion with no significant response to temperature changes, but a better hardness. In addition, it has a low thermal conductivity and is great for a heat-resistant material. The 7.7cm wall thickness meets the CNS12514 test specifications, and is awarded One-hour Fire Aging certification by the Ministry of the Interior. 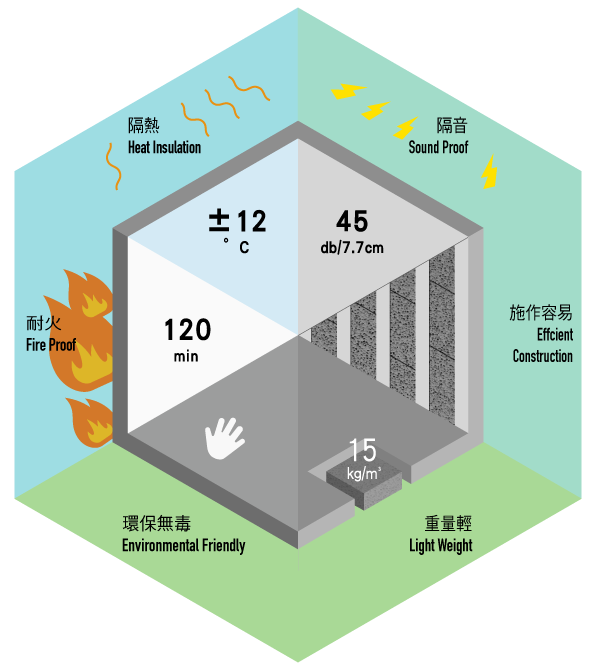 The single-material wall’s fire performance is even up to three hours without collapsing or penetration, with a melting point<br /> of up to 1108 ° c.
The per square-meter weight of AH lightweight insulation blocks are only 15kg, which lighter than an ordinary brick or concrete with a per square-meter weight of more than 265kg.The light weight can significantly reduce the occurrence of tilting and collapse of high buildings and renovated old buildings. 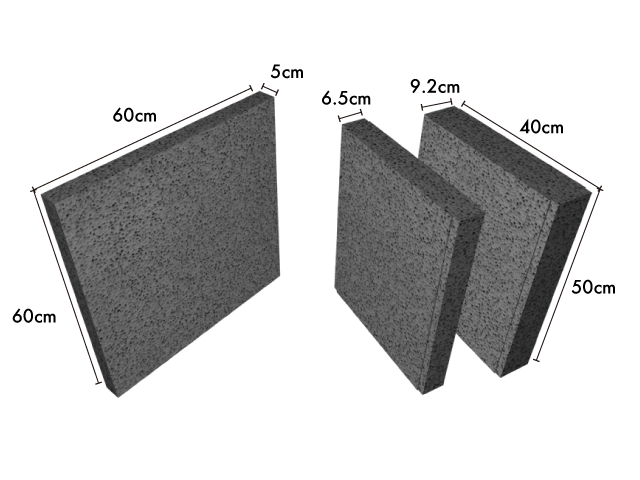 Verified with the CNS7333 test method, the thermal conductivity of AH lightweight insulation blocks 0.071 (W/m〮 k). In the actual verification, in the hottest summer days the indoor and outdoor temperature difference of buildings using AH lightweight insulation blocks for their surrounding walls is up to 12 degrees Celsius, and the use of electricity can be saved by 20% at an air-conditioning temperature controlled at 26-28 degrees Celsius. It does not just save energy but also saves money. Easy to construct. No highly technical work required. Fireproof, soundproof, heat insulation, safe, environmental friendly, and non-toxic. Suitable for people who care about living safety.